Login Get in the Fun! Early Bird registration expires February 19th, Late Registration of $67 begins March 25th! Social Coed – for the players looking to get out and be active. Leagues are 50% Games 50% Social. It’s a party! Athletic Men’s, Overhand – for our more serious players who love the thrill of victory and loath the taste of defeat! Games are a little more intense and teams more organized. These leagues are designed for players that have significant experience with the sport. Softball teams average 15 players per team. There may be gender requirements for certain leagues. Please check your rules sections. We allow individuals, small groups and teams to all join our leagues. NOLA Fray reserves the right to add additional players to ANY team that is under the official roster size for the league. During registration captains can pick up free agents or mark their group as ready to merge via commish. After registration closes NOLA Fray goes through and finalizes rosters by placing free agents, merging groups and deleting unpaid players. Being a promoted team does not mean you may not receive additional players. Teams who want to “lock” their roster may prepay for a team at the official roster size. Example, softball is 15 players officially but your team only wants 12 players. You can purchase a team spot for a roster of 15 and only fill your desired number but those additional spots are technically used and are not refundable. Our roster sizes tend to allow for more players as our goal is to avoid forfeits at all costs. 1. They are LAME. and 2. It’s not fair to the other teams in the league who expect to play each week if a smaller team cannot field a team week to week. Free agent teams (merged small groups or all FAs made into teams) tend to have larger rosters as the players typically do not know one another and everyone’s schedule varies week to week. First and foremost all NOLA Fray leagues are 50% Social and 50% Sport. We do have officials; however, we expect individuals to respect the league’s culture of fair and fun play. Foul language and rough play will not be tolerated and individuals who cannot adhere to our standards of fair play and sportsmanship may be asked to leave the league. NOLA Fray wants everyone to have a fun and be social while enjoying a great sport. NOLA Fray is proud to relieve captains of the burden of paying for full teams. While captains and players are able to prepay for additional players and or full teams, it is not a requirement for participation in our leagues. We welcome individual player payments. We are also proud to welcome those who do not have a full team (small groups and free agents) to participate in our league. Our primary mission is to make it easier for people to have fun and get involved with social sports and these policies help accomplish that goal. Because of these policies, all registrations are on a first come first serve basis and any roster that does not reach our standard size (based on each sport) is eligible to receive free agents and or small group by the league. Rosters made up of primarily free agents and or a collection of small groups may field more players than the standard roster size. This policy is in place to help ensure free agent teams are able to consistently field teams each week. 1. Ten (10) players (at least 3 females) on the field at all time. A. THERE ARE NO POSITION REQUIREMENTS of any players, i.e. there need not be 2 females in outfield and 2 in the infield) NOLA Fray rules will allow a team to play with a minimum of seven (7) players (at least 2 females). 2. If only two (2) females are present the team must take an out when it comes to the tenth batter. 3. The Minimum number of players in the field/your starting line up is 7 (5 men/2 women). 4. If playing with eight (8), no more than six (6) men are allowed on the field at one time. 5. If playing with nine (9) or more players, not more than seven (7) men are allowed on the field at one time. All batters will start with a 1-1 count (One ball, one strike). 1. If a male is walked and a female follows him in the batting order, the female must bat unless there are two (2) outs, at which time the female batter may choose to bat or take a walk. 2. A batter with two (2) strikes is allowed one (1) courtesy foul ball. On the 2nd foul after the batter has two (2) strikes the batter will be called out. 3. All games are six (6) innings or fifty-five (55) minutes; the last inning will start 10 – 15 minutes to the hour. The umpire will enforce this rule and will make the call at the top of the final inning. A. Some divisions may have shorter or longer game schedules depending on the season. 4. Due to differing circumstances in each and every game, some games will finish short of an hour in length, while others might run over the hour mark. Please respect your umpire’s call in this matter. They must keep all games on time in fairness to teams playing later hours and due to facility permit restrictions. 5. Teams may bat more than ten (10) players. Prior to regular season games, teams must submit lineup sheets to Umpire and opposing team captain if requested. 6. All players in the field must be listed in the batting order. Players do not have to play in the field in order to bat. 7. Games start on time! Teams must be prepared to play. Forfeit rule: 10 minutes after game time. If one team has less than the minimum number of players (7 total – 2 of whom must be females) at ten past the designated start time, the game will be deemed a forfeit. 1. NOLA Fray will provide all bases and balls for each game. Gloves and bats are not supplied and players must bring their own. Both ASA and USSSA bats are allowed in NOLA Fray Leagues at this time. No Senior Bats Allowed. 2. NO METAL SPIKES ARE ALLOWED. 3. All Pitchers are highly encouraged to wear a mask. Pitchers must supply their own mask. 5. Any equipment in question should be brought to the attention of the umpire. The umpire will make all final decisions regarding equipment discrepancies. A. The ball is thrown over the fence / road. B. The ball is thrown beyond the fence / road / safe area of play. C. The ball is thrown beyond the imaginary line extending from the End of the backstop (if there is no fence). D. This imaginary line applies to overthrows and caught fly foul balls. E. If the ball is overthrown and hits the fence behind the 1st or 3rd base lines, this is NOT considered out of play and the runner may advance, BUT at their own risk. F. On overthrows out of play, the runner is granted the base they were going to (at the point of the throw) plus one more. Note: in cases where a base runner runs past first base, they must make a clearly aggressive turn towards second base to be granted 2nd and 3rd in overthrow situations. 2. Line ups: All teams are required to supply lineups to the umpire and opposing team at the start of each game. A. Batting order must consist of a 2-1 ratio. For every 2 male batters in a row a female batter must be next, ie. every third batter must be a female. No more than 2 men may bat in a row. i. Females can bat multiple times in the lineup to achieve this ratio. If females are batting more than once in a lineup their rotation must stay in order. All females must evenly rotate through the female batting positions. ii. To ensure all players are able to bat, females may “double up” or rotate through the required female slots as described above. B. If a team bats in the wrong order, and the player has not batted yet, then they may fix it with no penalty. If a team bats out of order and the opposing team or umpire/staff catches it, after the player has batted then the batter who batted out of order is out and the next hitter is up. The lineup must also be changed to the correct order going forward. 3. Outfield Encroachment Line: Outfielders may not play closer than 150 feet from home plate. This line is to encourage fair play and will be set up by your umpire and marked by cones down the foul lines and/or across the field. 5. Inning run limit rule: There will be a seven (7) run limit per inning for innings 1-4. Unlimited runs may be scored in innings 5 and 6 always. B. Exception: If a team hits a home run and the 7th run is on base, then all runs, including the home run hitter shall count. Ex. A team has 6 runs and 2 runners are on base when the batter hits a home run. All 3 runs (2 runners and hitter) all count. 6. Home run limit rule: Teams are allowed 2 out-of-the-park home runs each per game. Any home run after the limit is an automatic out. If both teams have hit their 2 home runs, each team shall receive 1 additional home run. If both teams hit their 3rd home run, both teams shall be awarded 1 additional home run. This shall continue throughout the duration of the game with no team being allowed to have more than 1 home run more than their opponent once the 2 home run limit is reached. Each home run over the limit is an out. 7. No lead offs or stealing. Runners can leave the base once the ball is hit by the batter. If a runner leaves early, the ball is dead and the runner is declared out. If this is the 3rd out of the inning the batter will be first up in the next inning. 8. On an infield fly (any fly ball within the infield with significant arc and deemed an “easy catch”) with less than 2 outs and runners on 1st and 2nd or 1st, 2nd and 3rd, the batter is automatically out and runners can advance, BUT at their own risk. 9. If a Batter hits a line drive and HITS the Pitcher with the ball, the Batter is out and all runners must return to their previously occupied base. This applies to males and females. 10. Base runner to defensive player contact will be closely watched by the ump. A. Any excessive contact or collision will result in an “out” and/or ejection. This includes contact with the catcher. Sliding is allowed. Any intentional (in the eyes of the monitor) interference with the defensive player, the runner and the batter will be called out. 11. A Pitch must have a slow pitch arch at least 6 ft. and no higher than 12 ft. off the ground at its highest point to be considered a legal pitch. 1. If a rainout occurs while a game is in progress, three (3) innings must be completed for the game to count. The umpire clock is the game clock and will inform both teams when the game has started. Games ending due to rainout before the three (3) innings have concluded will not count, but will be rescheduled and played as a new game when possible. 2. There is no minimum number of innings for a complete game if the time limit has been satisfied. A. Team captains/asst. must add any roster additions electronically and player must sign the waiver electronically prior to playing in any NOLA Fray game. Failure to comply will result in a forfeit. B. Anything not covered in these Rules, please refer to baseball rules. Any conflict between baseball rules and NOLA Fray rules will be decided by NOLA Fray. C. Captains are responsible for knowing the rules and having a copy at each game. Parking along the first and third base fences is highly discouraged. All players and guests park at their own risk and the league is not responsible for any vehicle damage. A. All team captains/managers are required to have their credit card on file with the league and will be responsible for all unpaid league fees. Captains/Manager’s credit cards are subject to being charged the balance of the league registration fees owed at any time after the first game. B. All league fees are due the first week of the season. Any league fees not paid by week 2 will begin accruing a $25 per week late fee, beginning in week 3. C. Should a team still carry a balance by week 3 then the team shall be subject to forfeiting all their games and removal from the league. Exceptions may be granted by NOLA Fray management on a case by case basis. All teams are required to pay a $70 forfeit fee per season. If a team does not forfeit within the season, the fee shall be rolled over to the next season. If a team does forfeit, they must replenish the forfeit fee to the league within 2 weeks. A. Players may play in more than one NOLA Fray Softball league providing the leagues are on different nights! ONLY ONE TEAM PER LEAGUE PER NIGHT!!!! i.Players may fill in on other teams as substitutes to avoid forfeits for the regular season only. ii. If a player is found to be playing on more than 1 teams for playoffs, that player shall be suspended for the remainder of the season/playoffs and the team that the player is not on or whichever roster he was added to last, shall forfeit all remaining playoff games. The player is also subject to a suspension the following season at the discretion of NOLA Fray. B. Rosters are limited to 14 players per team fee, $400. Each additional player added is $15 per player. C. Rosters are locked week 3 of the season. Information with regards to rainouts will be made available as soon as the decision is made. A. NOLA Fray reserves the right to reschedule games to alternative locations on different days or possibly extend the season to accommodate rescheduled games. Additional time slots on game nights may be added, games may be shortened or rules may be modified to get as many games in as possible. If we experience as excessive amount of cancellations, we will need to cut the season short. And no refunds will be given. B. All seasons shall have a maximum of 2 makeup days on the regularly scheduled night of play. C. Playoff dates are set at the beginning of the season. If games are not made up due to conditions beyond our control, then league standings shall be determined by win percentage for playoff seeding. D. Playoff games shall be made up and played (If Possible). If, due to circumstances beyond NOLA Fray’s control, the games are not made up then the team with the best record in the regular season shall be deemed the champion. A. Each team must pay one umpire before each game starts ($28.00 per game per team). In addition, each team shall pay the official scorer prior to the start of the game ($10 per team). Should only (1) official show, each team shall pay $18.00 to the umpire. B. For the purpose of this rule, once the first pitch is thrown, this constitutes the start of the game. There is a 10-minute grace period for the first game only. C. Team must pay during this allotted time. Failure to do so will result in a forfeiture. A. Home team shall be determined by the flip of a coin prior to the game. i. If scorer does not show, it is the responsibility of the home team to keep the score and turn in to the night supervisor on duty after game. If this does occur, please note on score sheet that scorer was not present. B. For playoff games, home team shall be decided by seeding. A. All teams are responsible for removing their trash from the field, bleachers, and area surrounding the field. B. The teams that play the last game of the night are responsible for making sure there is no trash left on the field, bleachers, or the area surrounding the field. i. If there is trash that remains after the last game, then the 2 teams playing the final game of the evening will be fined $35 per team and will not be permitted to play until the fine is paid. Fines are payable to St. Patrick’s Booster club. A. Steel spikes are not allowed. Players must wear shoes. B. All catchers must wear a facemask. i. You may only use the softballs stamped USSSA Classic M Plus (with USSSA logo) or with the ASA Logo. ii. Softballs from past seasons may be used; The ball should be in “good, used” condition, determined by the Umpire. iii. Every team will furnish a new ball each game. Any backup balls used in a game must also be a Classic M Plus Softball with USSSA Classic Plus stamped on it or a .52 Cor ASA softball with the ASA stamp on it. D. BATS – Players may use any official softball bat that bears the approval of either ASA or USSSA. ii. If a bat appears to be altered (painted, sanded, and/or any other fashion and the label on the bat cannot be read), the umpire/supervisor shall determine whether the bat shall be removed from the game. Umpire’s/supervisor’s decision is final. No protest on game in question will be accepted. Program Director/Supervisor/Umpire reserves the right to examine any bat at any time. Any player(s) refusing to “show” a bat for examination purposes is subject to ejection. If bat is determined to be illegal, batter will be called “out” and will be ejected from the game. All base runners will return to the previous occupied base. For purpose of this rule, the illegal bat must have been used for at least one pitch and a pitch has not been thrown to the next batter. Second Offense: In addition to the above, player(s) will be dropped from the league. iii. The ASA and/or USSSA logo/stamp must appear on all bats used in all Games. No Exceptions. Lineups must be submitted to the official scorer five minutes prior to game time and should include team name and names of players (last name, first initial). B. If a player is injured, or becomes ill during a game, resulting in a team not having seven (7) players, the team may finish the game with less than seven players. C. If a player is ejected from a game, resulting in a team having less than seven (7) players, the team must forfeit and pay the associated fees. D. ADDITIONS may be made to lineup (at bottom) before the first time through the lineup is completed. Once each player has had one at bat, no additions may be made. Substitutions will then be made for any player arriving after the batting order has completed the first round. E. Teams may bat up to (15) fifteen players, but do not have to. Any ten on original lineup (to include any additions made to lineup before the first round is completed) may play defensively at any time. Any player that plays the field must bat! F. Any player that appears on the original batting order may substitute freely on defense without penalty. G. A SUBSTITUTE who is not in the original batting order, may enter the game only once. Once a substitute is taken out the game, he/she may not re-enter the game. All starters (original lineup with additions) may re-enter the game one time only. All substitutes must be reported to the scorekeeper and recorded on the score sheet. i. Ex. Johnny is not in the batting lineup. The coach puts Johnny in to run for Joey. Johnny now replaces Joey in the lineup. Joey may reenter the game for Johnny only once, he may not reenter for any other player. Once Johnny reenters, Joey is out of the game and may not return. H. Once a game starts and a player is removed from a game because of illness, injury or ejection and is not replaced, his/her next turn only at bat shall be an out and they shall be skipped in the lineup for any subsequent at bats. Game times for the entire regular season will be posted on the schedule on the website: NOLAFray.com, As soon as available. This is alive document and NOLA Fray reserves the right to change game times as needed. A. Ten (10) minute grace for first game only. No grace period for second or third games. If a team has seven (7) players they must start the game! Any grace period shall come off the allotted game time. C. Seven (7) innings or one hour and fifteen minutes time limit, no new innings shall start after 70 minutes. The championship game shall have a 1 hour and 15 minute time limit. i. Any rained out game that has not completed the above said innings shall be rescheduled and be replayed from the beginning when possible. ii. Should a game rainout in the middle of an inning, the score shall revert back to the last completed inning and count as a completed game. A. The pitcher will throw the ball easy, overhand, with or without an arc, or threequarters or sidearm. No submarine pitches allowed (wrist/hand cannot drop below the elbow)Umpire’s judgment! If the umpire deems the pitch illegal, then the batter has the choice of the result of the play! B. Pitcher can balk to all bases. NO hidden ball trick. C. Pitchers will be warned about hard pitching and/or submarine pitching by the plate umpire. i. On the first warning, the pitch will be called a ball. ii. Second warning is called a ball in addition to removal of pitcher from mound. The pitcher shall be allowed to play another position but may not return to the mound. iii. If batter swings at a hard pitch, the result of the play shall stand. A. The batter will be out on three (3) strikes and receive a walk on five (5) balls. B. Batters are allowed 2 courtesy foul balls after the 2nd strike. A 3rd foul ball after the 2nd strike shall result in the batter being called out. This includes foul balls over the outfield fence. (Home runs that go foul). A. Teams are allowed 5 home runs each per game & 1 Up. B. Any home run after the limit is an automatic out. C. 1 Up occurs when both teams have hit all their home runs. Each team shall receive an additional Home Run. If both teams hit the additional Home Run (ex: 6th HR), then both teams shall be awarded another HR. This shall continue throughout the duration of the game with no team being allowed to have more than 1 HR more than the other team after 5 HR’s. D. Each HR over the limit is an out. A. No batter may “dig in” the batter’s box by removing dirt thus creating hole(s) in the batter’s box. This will be a judgment call by the umpire. Each batter receives 2 occurrences per game, and on the 3rdoccurrence is ejected! i. The first violation will be a called strike. ii. On the second violation (by the same batter), an out will be called. iii. And, on the third violation (by the same batter), offending player will be ejected and must leave the park (to include the parking lot). B. Scorekeepers will “keep track” of the occurrences (per player). PLEASE NOTE: Batters will be allowed to move dirt in and around the box without being penalized. A. If a ball travels into the out of play area along the 3rd base line or under the scoreboard on the right field line, the ball shall be ruled dead and all players are awarded the base they are traveling too regardless of whether the ball comes from the outfield or infield. B. Players may catch a ball out of play if both feet remain in bounds. (Think NFL Football Sideline) These rules are to protect the fielders and not give an advantage to a base runner. A. Runners may take a lead at own risk. i. If played for, runner is forced back to base and must be tagged out. ii. If ball is overthrown on pickoff attempt, runner or runners may advance one base only at own risk. Runner does not have to tag base before advancing on an overthrow, but must attempt to go back to the previously occupied base before advancing. When runner reaches the next base safely, the ball shall become dead. B. No Stealing bases allowed. A. Courtesy runners shall be anyone on the roster, regardless of if they are in the lineup or not. B. Courtesy runners will only be allowed, after the batter reaches first base safely (or whichever base he attains safely on the play). The courtesy runner shall take his place on the base before a pitch is thrown to the next batter. D. Before a pitch is made, player may tag illegal baserunner for an out. E. In cases of injury, a courtesy runner will be allowed. In such cases, the injured shall not re-enter the game. F. When a team has batted around their lineup once in an inning (when the first batter of the inning comes to the plate for the second time in that same inning), the players who received a courtesy runner in their previous at bat in that inning shall be the only runners allowed to have courtesy runners for their 2nd at bat of the inning. G. Teams are limited to 2 courtesy runners per inning. H. Should a base runner become injured after his/her team bats around once in the same inning, the injured base runner may have a courtesy runner. The injured baserunner may not re-enter the game. Protests will not be permitted. Calls and rule interpretations by an umpire are considered final. A. Any player that is ejected from a game must leave the field and the area around the bleachers and fences immediately. B. Any player that is ejected from a game shall be suspended for a minimum of 1 game. The suspension shall be served the following game. C. Any player that continues to harass NOLA Fray staff, umpires, fans, or spectators from outside the fence, across the street, or any other location, before, after, during a game or after an ejection, shall automatically be suspended for 1 or more weeks. They shall be added to the player’s suspension if the player has been ejected from a game. D. All suspensions are subject to review by NOLA Fray and may be lengthened or shortened as needed. E. Any player ejected from 2 games during a season is subject to suspensions for the remainder of the season or longer. F. Any team that has 3 ejection occurrences during a season, will be asked to leave the league and shall forfeit their remaining games and registration and umpire fees. How much does it cost to join a NOLA Softball league? Registration dues vary by location and night. NOLA Softball strives to keep dues low while still providing a quality experience for our members. Most leagues range in cost from $45 – $62. This fee covers insurance, court costs, equipment, player t-shirts, parties, prizes, recruiting, and the tons of other NOLA Fray events that we will be hosting throughout the year. You definitely get your money’s worth! Each league gets at least 6 organized nights of games, playoffs (if applicable), league shirts, and league-wide parties where you’ll get to meet literally hundreds and hundreds of other players. You’ll also have access to all our other non-softball related events, shindigs and parties throughout the year. Please note, NOLA Fray does not issue refunds. 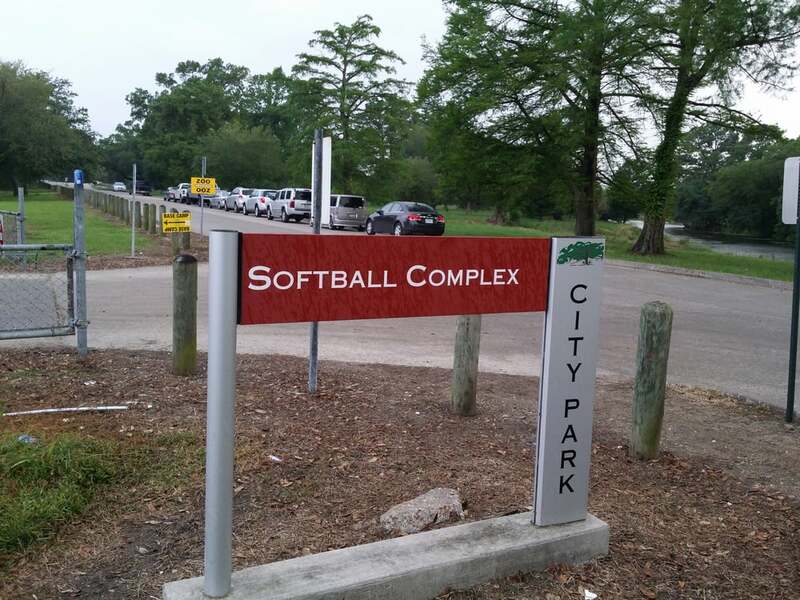 ← How much does it cost to join a NOLA Softball league? What’s a NOLA Softball game night like? You simply show up at the fields for your scheduled games, you and your teammates play your opponents for about 60 minutes and then everyone heads on over to the nearby sponsor bar for food, drinks, and partying! It’s a ridiculously easy formula that’s seriously fun! Game times vary by location but weekday leagues are run in the evening anywhere from 6pm to 10pm. Weekend leagues vary from morning to evening hours. ← What’s a NOLA Softball game night like? How big is a team? Softball teams average 15 players per team. 12 paid and approved players reserves a spot in the league but is subject to additional players. There may be gender requirements for certain leagues. ← How big is a team? First Offense: Loss of game. Second Offense: Loss of game and staff reserves the right to remove team from playoffs. Third Offense: Potential Removal from the league, at the discretion of league commissioners. Any team that forfeits more than once also forfeits any guarantee or right to a certain number of guaranteed games. If you know in advance that your team is going to forfeit a game, we encourage you to call our office, at (504) 446-0197, so as to help us notify your opponent. Teams have until ten minutes past the designated start time to field a full squad (minimum numbers of players required to play according to the rules). Refer to rules regarding gender policies(batting ratios, female designated football plays, etc). Anything less then the minimum must be approved by the staff and opposing team. People I don’t know are on my Roster. Why? First… are you sure you don’t know them or that they aren’t a friend of a friend? Once you’ve checked that, it likely means free agents or another small group has been merged onto your team. When groups do not reach full team size we merge groups and free agents together to fill out rosters. To learn more about our how the roster management and group / free agent mergers work check out our full roster management page here! ← People I don’t know are on my Roster. Why? How does this “social sports” thing work? NOLA Fray operates a lot like the sports leagues of your youth. Our goal is to connect people and to play more often! Our leagues are 6-8 weeks long with a final championship tournament and end of season party, though we also host one time events during the season as well. From games, to league parties, to scavenger hunts, NOLA Fray organizes the events so all you have to do is show up and have fun! ← How does this “social sports” thing work? Why should I join NOLA Fray? NOLA Fray understands that for most people, joining a sports team is about hanging out with your friends, having a good time and meeting some new people. We strive to keep the games fair and stress free so you can do just that… socialize and have a good time! ← Why should I join NOLA Fray? What’s a NOLA Fray game night like? You simply show up at the courts/fields/bar for your scheduled games, you and your teammates play your opponents for about 30-60 minutes, and then everyone heads on over to the nearby sponsor bar for food, drinks, and partying! It’s a ridiculously easy formula that’s seriously fun! Depending on the location and day, weekday games are played between 6:00 and 11:30 pm. Weekend games can be anytime during the day or evening. Please check your specific league page for more details. ← What’s a NOLA Fray game night like? How old do you have to be to join? All players must be at least 21. Why? Because playing your game is only a small part of it. A large part of the fun happens at the bars after the games are done! Most players are between 23 and 31 years old and 60% are female. ← How old do you have to be to join? Is this a competitive league? Since the beginning, NOLA Fray has always been more about meeting people, playing a fun game and socializing afterward at the bar. A few players are naturally more competitive than others but don’t worry, 95% of DC Fray is NOT competitive. As we have grown we have begun to offer divisions for different skill levels for select sports BUT every league we offer is inherently SOCIAL, in that we are all out there to have a good time and meet new people! ← Is this a competitive league? I have a group of friends who want to play. How can we make sure we’re on the same team? Your ringleader simply forms a new group during the registration process. Once they’re registered, everyone then registers under that group / team. Easy, Peasy! Doesn’t matter how small your group is, we’ll keep your buddies together when we merge and finalize teams after registration is closed. Start telling your buddies to sign up now! ← I have a group of friends who want to play. How can we make sure we’re on the same team? What if I don’t know anyone in NOLA Fray? Can I still play? Absolutely! A large majority of NOLA Fray players sign up as independents or in smaller groups. Once registration for a division is closed, we merge all free agents and small groups into bigger teams, as space is available. Right off the bat, you’ll get to meet new people from your team alone, not to mention all the other players from the other teams as the season plays out! NOLA Fray is the EASIEST way to meet people and make new friends! ← What if I don’t know anyone in NOLA Fray? Can I still play? What if I don’t like my team? Lots of people join NOLA Fray for different reasons and sometimes you may find yourself on a team that you just don’t mesh with. No worries, shoot your league commissioner an email and we will find you a new home! ← What if I don’t like my team? How do rainouts and game cancellations work? We make the final call a few hours before the games the day of, but for the most part, we usually play through a light drizzle. Any lightening in the area and games are cancelled. At permitted locations that call to cancel is made by the operating DPR. We usually build one or more weeks of make up days in case of weather. If a league has multiple cancellations, games MAY NOT be able to be made up. Call the Weather Hotline to check the status of your games: 504-273-7057. ← How do rainouts and game cancellations work? NOLA Fray has a no refund policy. Often our rosters have limited space and last minute cancellations hinder our ability to properly plan and organize the season and our leagues as well as the costs that have already been incurred by the league. If you are unable to participate after completing the registration process we are able to transfer your registration to a future season! ← What is your refund policy? To register select your desired day and location. Make sure to read through the season info before signing up (dates, location, etc). Click through the links and you will be guided through the process. ← How do I join? Is your payment processor secure? Absolutely! We use commish and Stripe as our processor. Simply follow the prompts at the end of your registration to pay with your debit or credit card. ← Is your payment processor secure? Can I pay for my friend(s)? If you would like to prepay for other players or for an entire team you have the option to do so when registering! Once you are on commish and on the option to “Choose Your Destiny” there will be an option to Prepay for Others. Simply enter the number of additional people you are paying for, create a prepaid code, and your total cost should update next to the box. Provide your created prepaid code to your players to use when they go to register for the season to mark their registration as paid. Some of our divisions now offer an option to prepay for a full team! When you are creating a team/group you can select to “Prepay for a Team” just under the prepay for others option. The total for payment should be reflected on the right-hand side of the screen. Complete the rest of the registration prompts and proceed to the payment screen. When you pay for a full team you are paying for a team spot in the league and a specific number of roster spots. Your teammates still need to register for the season and apply your prepaid code! If you would like additional players you can add additional roster spots at time of checkout or after the purchase. If you have a corporate company team or want to bring a very large group of rotating players, please email [email protected] to talk about corporate programs! ← Can I pay for my friend(s)? Are there team rates? Does everyone need to register for the league? Yes, we do offer the option to pay as a team. Since our registration is individually based, the team rate is based on an official roster size times the registration cost. For steps on how to pay for a team during the registration process please check the FAQ above. Every player must be a registered member on the roster. We do not allow subs/walk-ups/whomever to play with us without being a registered NOLA Fray player. Certain leagues CAN use subs as long as that person is registered in the same division. ← Are there team rates? Does everyone need to register for the league? Welcome to NOLA Fray - your new home for all fun things in NOLA! You're about to join our Spring season of coed Softball! This season will feature 6 -7 weeks of regular season games and then an end-of-season tournament for playoffs! Games begin April 4th and run weekly from 6:30-9:30pm. Free Agents: We encourage players who want to play but do not have a team/group to join to still play with us! Registered and paid Free Agents are able to be picked up by Captains during registration or will be placed on to a team by the league once registration closes. On a mission to make fun possible. Copyright © 2019 United Social Sports Inc.
Sign up for our mailing list, and be the first to know about upcoming seasons, events, tournaments, and more! Sports - Be active, be social, and most importantly, have fun.